Kail (Brassica oleracea Acephala Group) is a vegetable wi green or purpie leafs, the central leafs o it no bein in a heid shape. It is conseedered tae hae mair sibness wi wild cabbitch nor maist domesticate cabbitch. The species Brassica oleracea conteens mony kynds o vegetables, includin broccoli, cauliflouer, collard greens, an brussels sproots. The cultivar group Acephala includes spring greens an collard greens an aw; thay're unco seemilar genetically. Beta carotene, vitamin K, vitamin C, an calcium is rowth in kail. 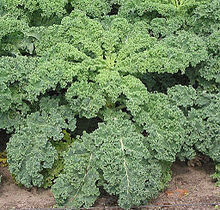 Kail is a soorce o twa carotenoids, lutein an zeaxanthin. Kail, as wi broccoli an ither brassicas, conteens sulforaphane (parteecular whan it's been chappit or minced), a chemical wi potent anti-cancer properties. Bylin lawers the leevel o sulforaphane; housomeiver, steamin, microwavin, or stir fryin disna cause a important loss. Lik ither brassica vegetables, kail is a soorce o indole-3-carbinol an aw, a chemical that forders DNA repair in cells an appears tae keep cancer cells fae growin. Kail haes been foond tae conteen a group o resins cried bile acid sequestrants, that haes been shawn tae lawer cholesterol an lawer absorption o dietary fat. Steamin signeeficantly accresses thir bile acid bindin properties. Wikimedia Commons haes media relatit tae Brassica oleracea var. sabellica.